The Snare: According to Smith, the wire would be looped around a tree and the snare wire through it. McCain and Smith agreed to use bungee cords on all the snares to absorb the shock from a snared animal. 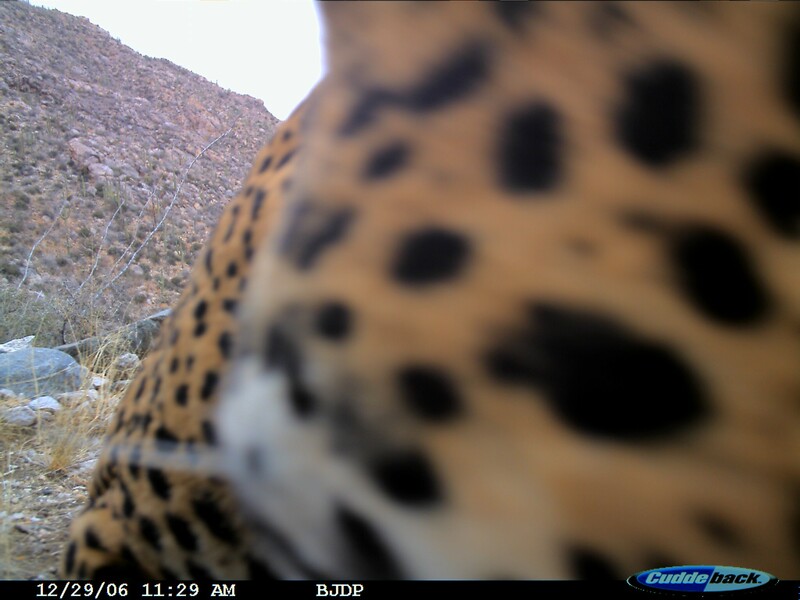 In addition, they agreed to use a short leash and bungee cords because they ” had talked about this and there might be a jaguar in this area” (this is the “jag friendly” reference in regard to the snare set when McCain contacts Dr. Aguilar about proper drug and dosage for a jaguar capture). Smith stated that McCain had told him that snared jaguars “they get a run up as fast as they can and…just destroy themselves. 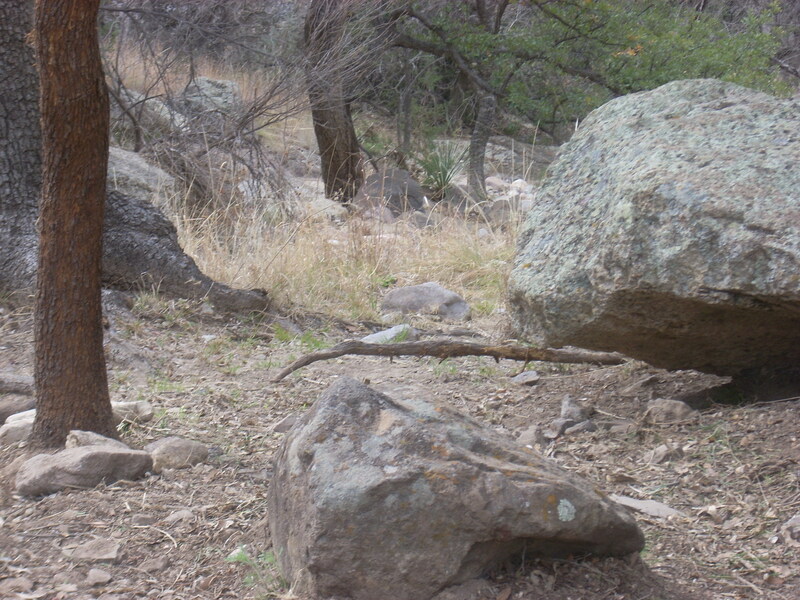 They’re just so powerful they just rip their arm out.” So because of that, McCain and Smith “wanted a short lead with no shrubs around it and this is generally how we set them all.” Apparently large rocks and boulders next to the snare and within reach of a snared animal were not safety concerns for them. Below is a picture I took of the snare site where Macho B was captured. Smith also said: ” swivels were used on the snares to keep animals’ forearms from breaking; tape was used on the snare loop to keep it from overly tightening and it keeps the animal a little insulated from the snare wire; a thinner gauge wire (3/16 of an inch) was used so it could set faster.” Crabb clarified that electrical tape was wrapped around the snare wire enough to create a stop, but the entire snare cable that would wrap around a captured animal’s foot was not wrapped. In essence, there wasn’t much “padding” provided to a snared animal to prevent the cable wire from cutting into them. See link under blog roll for videos about setting a snare. The photo below is from the AZGFD website. It is Macho B’s snared foot. Snares were checked only once a day, by eight in the morning, despite the field team staying within five miles of the snaring area. McCain’s academic advisor “criticized AZGFD for not taking extra precaution considering the jaguar presence and employ radio sensors on the snares to immediately alert the trappers of a snared animal.” Such sensors would minimize stress and injury to any snared animal as the animal would be tended to quickly instead of being trapped for an unknown amount of time. 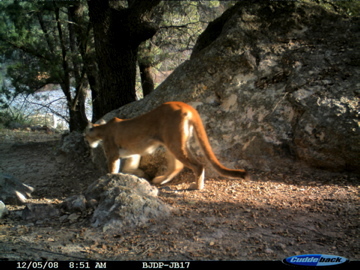 And if there was ever an area and time of year to employ these sensors and to check the snares more than once a day, Penasco Canyon in the winter is it. The Area: Penasco Canyon is close to the US-MX border. It has a 4wd road that dead ends at the canyon from the north and a century’s old trading route that passes through there from the south. The canyon is easily accessible and frequented by hunters, birders, hikers, immigrants, smugglers, and occasionally, border patrol. 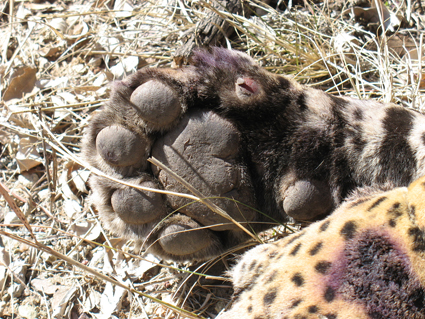 The human activity in the area posed an additional threat to the safety and well-being of any snared animal. 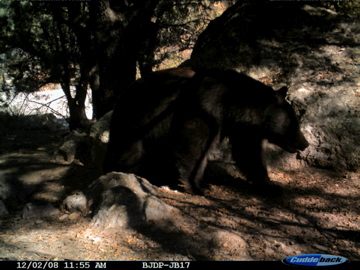 The canyon also has an amazing diversity of life and any animal snared could be vulnerable to attacks from another animal. 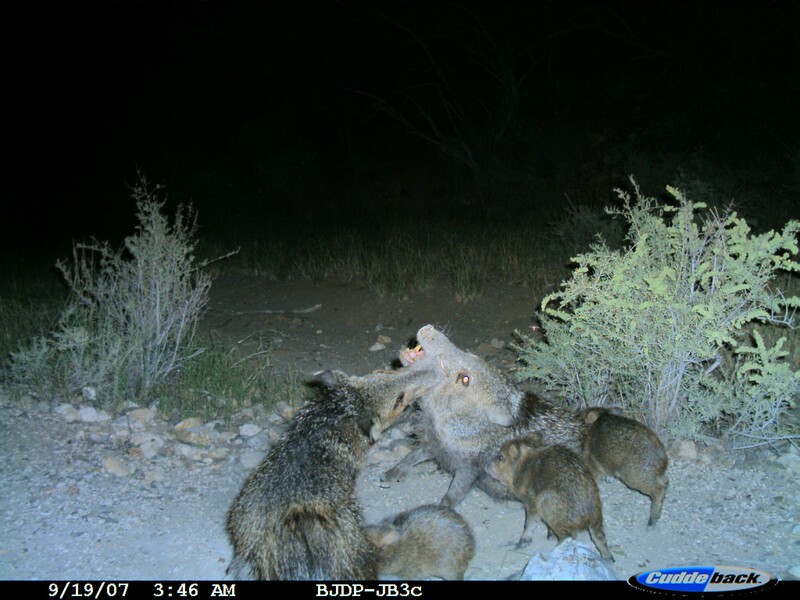 A javelina tooth was found in Macho B’s tail when he was initially captured. Though Smith thought it was an older injury, there is a chance that it wasn’t and Macho B’s claw marks that were found seven feet up the mesquite tree he was tethered to could be evidence he was trying to escape a javelina attack (this animal has bad eyesight but a good sense of smell). In addition, since AZGFD was using McCain’s knowledge of the area for the snaring project, McCain knew from BJDP photo data that in the colder months lions switched up their movement patterns from being active mostly from dusk to dawn to being active anytime day or night. Thus, a lion, maybe a bear, and perhaps Macho B, whom was captured on film a few times during the day, could be snared for close to twenty-four hours. And another factor that should have been considered for upping the amount of times the snares were checked was the weather. In southern AZ, winter can mean a seventy plus degree day and then the temperatures can plunge into the teens at night. Winter here can also be just plain cold, and produce such fun things as freezing rain and snow. This extreme temperature range leaves snared animals vulnerable to both hyperthermia and hypothermia. Macho B was hypothermic. Frost was on the ground when Smith and Crabb found him and when his temperature was taken it was four degrees below normal. And another safety consideration to keep in mind is despite all the preparations for capturing an animal there was virtually no preparation (except having the recommended drugs) for handling any animal, this includes the only known jaguar to be documented in the United States at the time, Macho B.